Iron Oxide mass is used for the removal of H2S from gas stream. 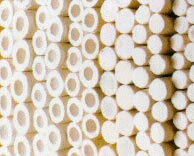 The mass is normally supplied in the form of extrudates and granules dispersed on wood shavings. Low pressure drop across bed.